Follow Mark Rayner's directions to create a simple hanging bird feeder from a few pieces of plywood and a terracotta pot and saucer. You will need: 40mm galvanised nails, 9cm terracotta pot, 13cm terracotta saucer, 3 pieces of 19mm treated plywood measuring 90mm x 380mm, 1 x 25mm treated plywood measuring 90mm x 380mm, clean cloth, tape measure or ruler, pencil, saw, sandpaper, set square, hammer drill with drill bit, exterior PVA glue, stainless-steel eye, hook, paintbrush, exterior construction glue and length of galvanised chain, two Resene Waterborne Woodsman testpots of Resene Totem Pole. 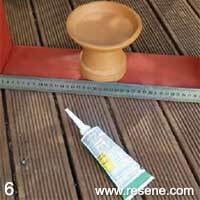 Here’s another idea: The wooden frame could also be constructed from offcuts of decking planks and painted with any Resene testpot colour – but do ensure any bare wood is first primed with a coat of Resene Quick Dry. Measure and mark the pieces of plywood to the required dimensions listed. 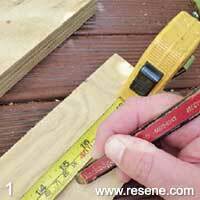 Use the back of the saw or set square to rule cutting lines at 90 degrees. 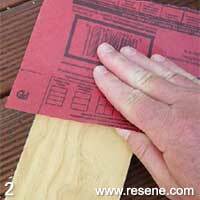 Smooth any rough edges with sandpaper and wipe off any sanding dust with a clean cloth. 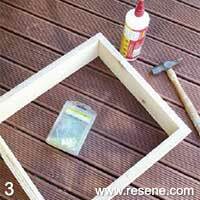 Assemble the plywood into a rectangular frame, as shown, flat each corner with PVA glue and 40mm nails. Use a set square to ensure corners are at 90° angles. Allow glue to dry. 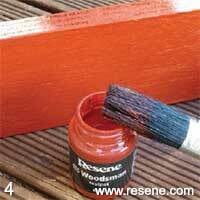 Apply two coats of Resene Totem Pole to the plywood frame, allowing two hours for each coat to dry. Screw the eye hook into the centre of the 25mm-piece of plywood, drilling a pilot hole first. 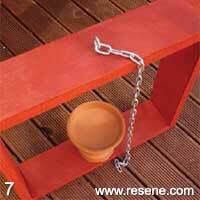 Using construction glue, fix the terracotta pot and saucer to the base of the frame, as shown. Use a tape measure or ruler to ensure it’s in the centre. Allow glue to dry. 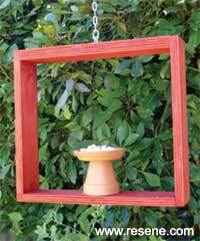 Attach the length of chain to the screw eye and hang the bird feeder in position.